If I have a file containing 200,000 lines of code open in Notepad++, the thumb of the vertical scroll bar is very small, and if I am near the bottom of the file, the space between the thumb and the bottom of the scroll bar (which is the place I would normally click to move down a page) is so small that it can be difficult-to-impossible to click. In this circumstance it can take a very long time to get to the place in the file that I am seeking. 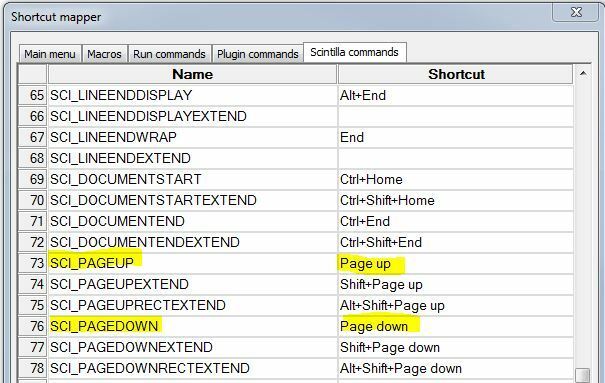 If the Page Down and Page Up keys on the keyboard worked (like they do for most Windows applications), then this would be another way of moving fairly rapidly through the file, looking for the bit I need, but the keys don’t work. They do nothing at all. Why don’t these keys work? Is this by intention or a programming mistake? Can they please be made to work?